Our home care services are provided by a loving and experienced Certified Nurse Aide, Home Health Aide, licensed Practical Nurse, or Registered Nurse on an hourly, live-in, or per visit basis. Click here for more details. All caregivers are insured, bonded, and carefully screened through Level 2 national background and reference checks. Click here for more details. We ensure that our caregivers arrive on time to a client’s home through our Telephony Clock in and out System. Click here for more details. We offer Care Management as well Medication Management Services. Click here for more details. We can provide skill nurse Visits by a Registered Nurse. Click here for more details. We perform monthly supervisory visits to monitor and assess whether our Caregivers are compliant with following the prescribed home care plan and to ensure that our client’s are pleased with the care being provided. Click here for details. 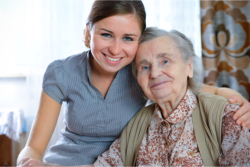 We accept and file most long term care insurance policies to pay for our home care services. Click here for more details. Give us a call today at 1-888-750-6846 or send us a message and we would glad to give you references from our previous and current clients.